Jordan Spieth set the tone pulling driver on the 396-yard opening hole and sending it bouncing and rolling to 10 feet for eagle. Moments later, Tiger Woods sent the gallery into a frenzy with three straight birdies to get into contention at a major for the first time in five years. Canada's Adam Hadwin shot 1-over (71) and sits tied for 51st heading into Sunday. A bogey on the 16th and a par save from short of the Barry Burn on the 18th gave him a 66, his lowest score in a major since the 2011 Masters, and left him only four shots behind going into the final round. 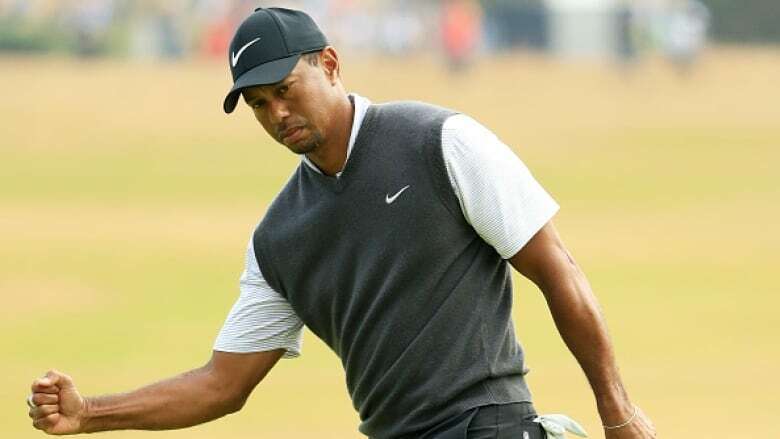 Woods, winless in the majors since the 2008 U.S. Open, hasn't been this close to the lead going into the final round at a major since he was two shots back at Muirfield five years ago. Not since Woods in 2006 has the defending champion gone into the final round with at least a share of the lead. The biggest advantage he sees is to "expect the unexpected," and the most windy conditions of the week might make it every bit of that. "I felt good about the range session. And he's like, `I put my chips behind anything you decide, always.' And that kind of gave me that little extra boost," Spieth said. Kisner had the 54-hole lead at the PGA Championship last year. "I would imagine it's going to be more of a grind all day," he said of the final round. "I don't foresee guys going out and making four or five birdies in the first eight or nine holes. But who knows? They're damn good players."